On Saturday, May 31, for the first time in the history of the existence of our national minority in the territory of Albania a Serbian Patriarch visited the church of the “Sveta Trojica” of Vraka and members of the Serbian-Montenegrin minority who were in large numbers gathered to honor his visit in front of the church. His Holiness Serbian Patriarch Irenej was accompanied by the Mitropolit of Montenegro Mr. Amfilohije and the Metropolit of Berat Mr. Ignatius of Albanian Orthodox Church.Entering the church His Holiness Serbian Patriarch Irenej was welcomed by the Metropolitan of Berat Mr. Ignatius, in the name of Holy Synod of the Albanian Orthodox Church and His Beatitude Archbishop of Tirana Mr.. Anastas, who thanked the Serbian Patriarch for His arrival in Albania to participate in religious celebrations in Vraka and i Tirana. After welcoming greetings on this occasion, Patriarch Irenej spoke to religious people. Keep and save your Holy Orthodox faith. From the earliest time till now, and hopefully in the future our holy church will live here, that truth of the gospel will be revealed, and that God will teach us to pray, and to respect each other and appreciate following the Lord’s wish . I wish you all the best and God’s blessing from this wonderful holy church to be poured on your family and your children and to all of you in this holy temple who are attached with faith and love to God . May God’s blessing follow you all the days of your life. 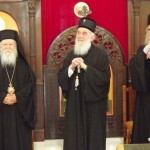 Amen, “said in his homily, His Holiness Patriarch Irinej. “Your Holiness! Welcome to Shkodra. This is the day which the Lord created to our happiness and to enjoy. The day which generations of Serbs in Albania are waiting for centuries. Your arrival on the fireplace of our ancestors, their graves and for us, their descendants is a great blessing. You know best, Your Holiness, what the suffering passed through the Serbian Orthodox Church in the region. Temples were destroyed, priests persecuted and killed, and the bells fell silent. Persecuting the Lord Jesus Christ, it was the timee of suffering of His followers and believers. When seemed to be no end to our forgetfulness, by the opening of the relics of Saint John Vladimir, King of Zeta and martyr and also the restoration of the Orthodox Church in Albania, headed by His Beatitude Archbishop Anastasi, and the arrival of the Metropolit of Montenegro Amfilohije in Cetinje, at the beginning of the nineties followed by his constant concern for the fate of the rest of our people in Albania, things began to change for the better. We went back to a life as devoted people and Christians. This temple is the sign of the return to our ancestors’ faith and the Holy Trinity in Vraka, which was built by joint efforts of the Albanian Archbishop Anastas and Metropolit of Montenegro Amfilohije. There’s no better formal occasion, and a better reason than your arrival and presence here in Albania, to ask in agreement with His Beatitude Mr. Anastas, during your next visit together to consecrate this sacred temple. Your arrival is a great blessing for the country and for the people, and the great bridge of peace, love and understanding. Welcome and for many years ” concluded his greeting Mr. Simo Ajković. The Serbian language course attendants at the Association “Moraca- Rozafa” and Orthodox youth of Shkodra and Vraka organized in honor of Serbian Patriarch a program of recitations and traditional songs and folk dances, gathered in the cultural group “Obilic” from Shkodra. “Your Holiness! Let me use this occasion to transmit to You our greetings in the name of Serbs and Montenegrins in Albania. Your arrival in this country is of great importance for the life of our community. We are confident that Your presence here will infuse new strength in the further struggle for the preservation of the identity of our people, who for decades were severely deprived. Association, “Moraca- Rozafa” for more than two decades brings together Serbs and Montenegrins, so that we can preserve the language, religion, customs and culture of our people. The first ten years we had no help from those who were legally obliged to provide it to us. On the contrary, we were severely persecuted. In the last ten years, thanks to the care and efforts of Metropolit of Montenegro Amfilohije, we had spiritual and material support. Thanks to this, we have not only survived but also developed our activities. We also had the support of the Republic of Serbia, which has, through the Ministry of Diaspora and the Ministry of Culture met our needs. This assistance has primarily focused on the creation of conditions for learning Serbian language and culture. So far we have realized about thirty projects in the area. But there are plenty of things that have not been resolved, and which for us are vital. We expect the Republic of Serbia to provide long-term and stable support to our efforts. Since Serbia timely is resolving the issue of citizenship of the Serbian minority in countries of the region, we expect that the issue of obtaining Serbian citizenship and our minority in Albania to be also resolved. Please, Your Holiness, help us in this matter. Your current visit and any future for Serbs and Montenegrins in Albania will be new encouragement to hold on in times to come. We thank the Lord and Saint John Vladimir for honoring us with your presence and blessing, and it’s our generation graced to welcome for the first time in our history the Serbian Patriarch in Vraka and Shkodra. Welcome always “, said Mr.. Pavlo Brajović. The ceremony on the occasion of the visit of Serbian Patriarch Irinej of Vraka and Shkodra, was attended by priests of the Mitropoly of Montenegro and the Albanian Orthodox Church, the Ambassador of Republic of Serbia in Tirana Mr. Miroljub Zaric, Director of the Office for Cooperation with churches and religious communities in the Republic of Serbia Mr. Mile Dr. Radojevic and associates, as well as many believers from Vraka, Shkoder and Montenegro. Gathered people was composed by the Orthodox and members of other religions of our people and our friends, who had come to welcome and greet the Serbian Patriarch. After some refreshments, Patriarch Irinej, Mitropolit Ignatius and Amfilohije, the clergy, representatives of the Serbian organizations and delegation of the Serbian and the Albanian Orthodox Church, visited the remains of the ancient monastery of St. Sergius and Bacchus from the 13th century, on the river of Buna, where it is assumed that Serbian kings from the famous dynasty of Vojislavljevićs. were buried. Bowing to the ruins of the monastery, His Holiness The Patriarch prayed to God for the repose of the soul of Serbian kings, saying, “May the Lord forgive the souls of those who rest here, bless us to continue the history and life, in order to pass on it to those who come after us” . After touring in Vraka, Shkodra, of the ancient monastery of St. Sergius and Bacchus delegation of the Serbian Orthodox Church headed to Tirana to participate in the consecration of the Cathedral of the Resurrection of Christ. The visit of Serbian Patriarch in Shkodra and Vraka would not have been successful without the unreserved cooperation and engagement of law enforcement who guaranties the necessary security conditions despite the announced protest by nationalist circles in Albania.